To make a perfect hard cover or case, you need to cut the corners at an exact 45 degree angle, 3 mm form the edge, to get the consistent professional results your customers demand. 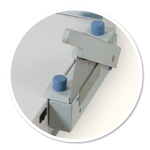 Fastbind Corner cutter Ha10™ allows you to cut the four corners of your cover in an even and accurate way. It is adjustable according to the thickness of the cover boards. The new design makes it easy to clean the cutting blades. The Ha10 is compatible with all Fastbind Casematics. 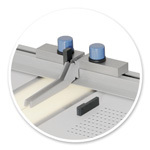 The Side Guide makes the registration of any material that is solid or where you can not print the registration marks that help the operator line up the cover and boards. With the side and back guides, you can pre position the spine and boards, and then use the guides to fix the position for that and additional covers! 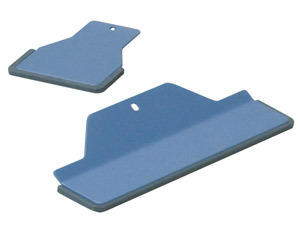 Additional size spine guides are available for our older generation of case makers. Our current generation requires only the quick change spacers (next). Different kinds of books require different spacing needs between the spine and front/back boards. With the Fastbind Quick change spacer set, you can make any book cover or case imaginable, from CD cases, custom printed hard covers, restaurant menus, 3 ring binders and much much more by just changing the spacers on any of our Casematic "H or L" series case makers!